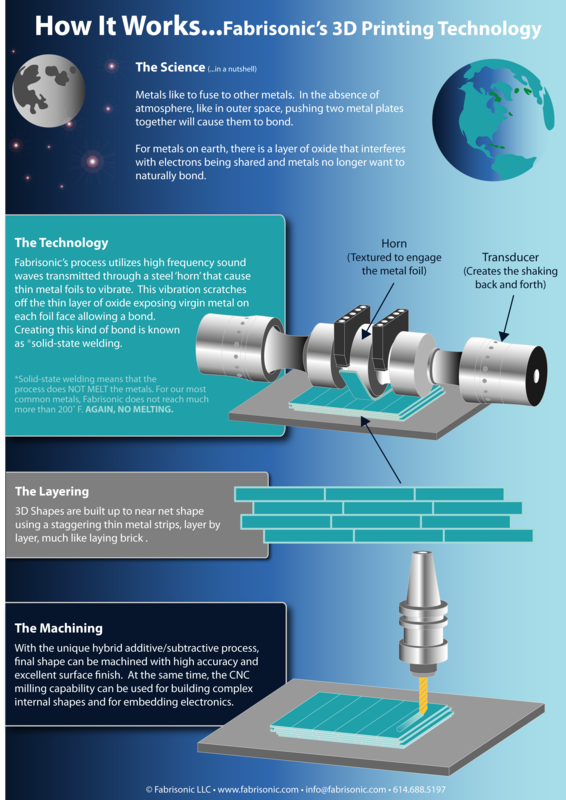 Navigation:Home»Industry»Fabrisonic’s 3D Printing Technology: Metal Additive Manufacturing Without Melting? Additive Manufacturing has already had a disruptive impact on the world of manufacturing allowing parts made faster, made with never before seen complexity, and brought to market in less time. 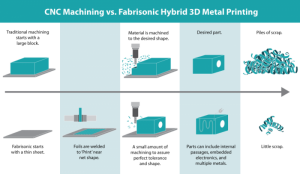 Ultrasonic Additive Manufacturing (UAM), developed by Fabrisonic, combines a unique room-temperature metal deposition process with the ease of traditional CNC milling. Our patented ultrasonic ‘print head’ is integrated into 3-axis mills to create a hybrid additive-subtractive process. Swapping from additive to subtractive is as easy as doing a tool change. Protects material properties of the incoming feedstock – Since the materials are only slightly heated, the materials do not experience changes in grain size, precipitation reactions, nor phase changes. The properties of the incoming feedstock are the same as the properties of the final part. Creates bonds between dissimilar metals without creating an undesirable brittle metallurgy – This capability differentiates UAM from fusion based processes and enables Fabrisonic to print engineered materials with custom material properties or properties to match an existing component. For instance, layers of Molybdenum and Invar can be printed into an aluminum heat exchanger to match the CTE of a mounted electronic circuit. Embed temperature sensitive components in solid metal parts – Many electronic components including microprocessors, sensors, and telemetry have been successfully embedded in solid metal part using UAM. 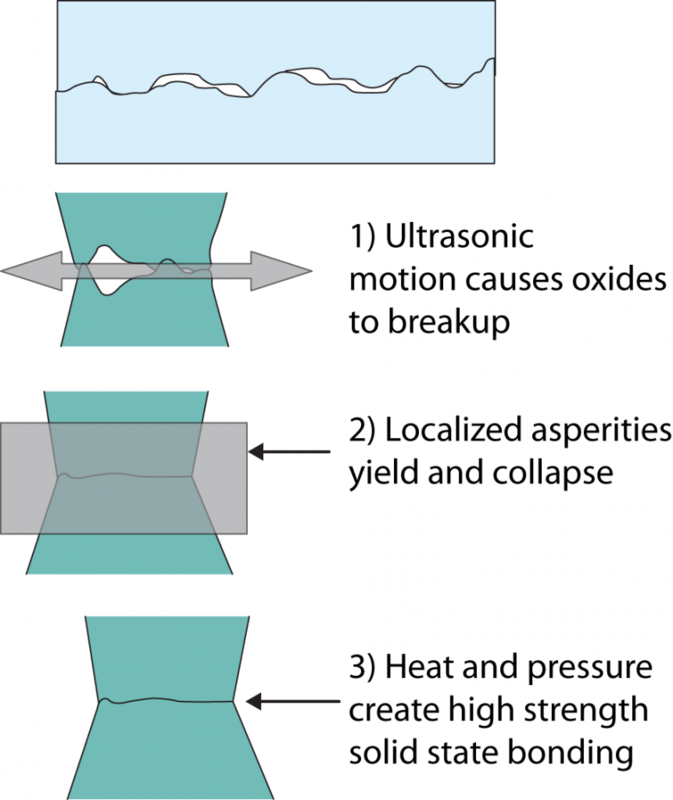 The low-temperature bond allows delicate components to be embedded in solid metal without the damage incurred in comparable fusion based additive processes. UAM is ultrasonic welding on a semi-continuous basis where solid metal objects are built up to a net three-dimensional shape through a succession of welded metal tapes. Through periodic machining operations, detailed features are milled into the object until a final geometry is created by removing excess material. The figure at right shows a rolling ultrasonic welding system, consisting of two 20,000 hertz ultrasonic transducers and the welding sonotrode. High-frequency ultrasonic vibrations are locally applied to metal foils, held together under pressure, to create a weld. The vibrations of the transducer are transmitted to the disk-shaped welding sonotrode, which in turn creates an ultrasonic solid-state weld between the thin metal tape and the substrate. The continuous rolling of the sonotrode over the plate welds the entire tape to the plate. Successive layers are welded together to build up height. This process is then repeated until a solid component has been created. CNC contour milling is then used to achieve required tolerances and surface finish. 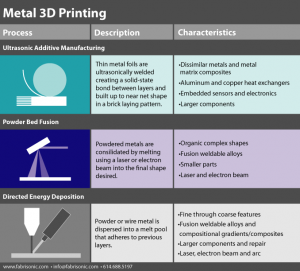 How does it compare to other forms of 3D metal printing processes? HYBRID – WHAT IS THAT? Synonyms include additive fabrication, additive processes, additive techniques, additive layer manufacturing, layer manufacturing and free-form fabrication. 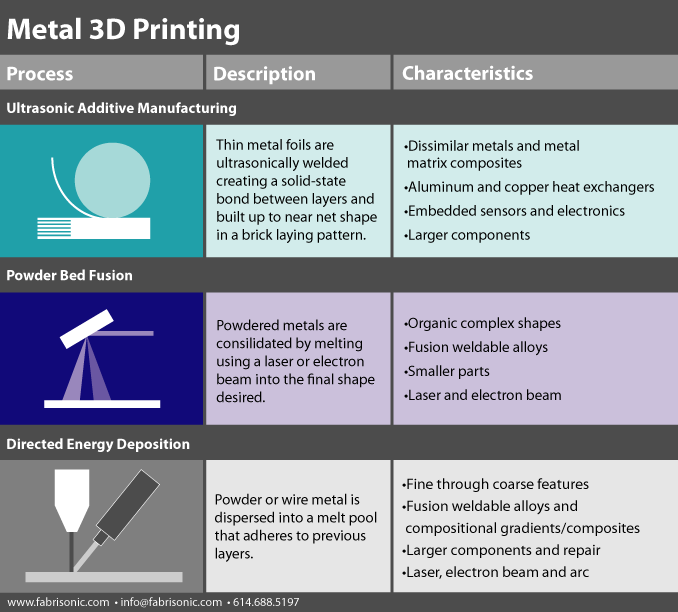 (Know the Top 10 used materials in Additive Manufacturing Industry). 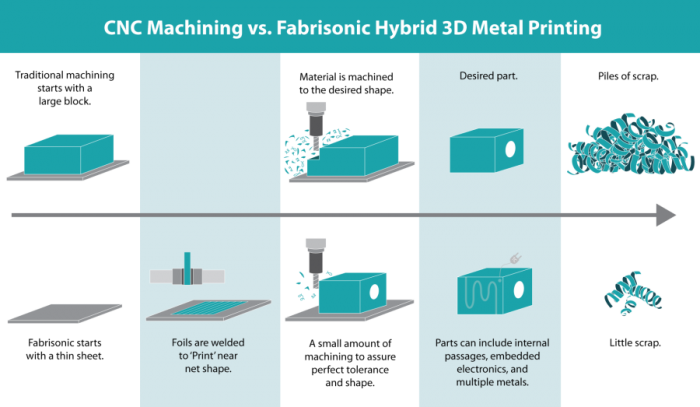 While not formally defined under ASTM terminology, hybrid additive is generally considered to be a combination of additive (3D printing) and subtractive (CNC milling) technologies in a single machine. For instance, the SonicLayer 4000, starts off life as a large three-axis mill to which we integrate our patented ultrasonic welding head. The system builds up to near-net shape using ultrasonic welding and completes fine detail through the use of onboard CNC milling.